Rose Valley Trek: A fantastic experience for the Nature lovers, and exhilarating trekking experience in Morocco. While hiking tour in Roses valley, you will discover Dades, Mgoun valleys, and its surrounding Berber villages, and hike towards the south of the high Atlas mountains. You will explore the colorful world of the Kasbahs with Berber team. The kasbahs villages are built from stone and mud; it is a secluded place that has managed to keep its originality. 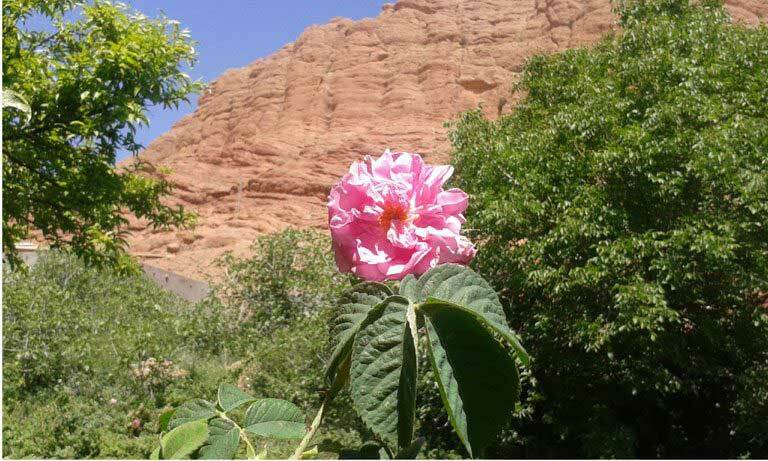 An exciting time to visit this unique valley is during the festival of roses, which takes place in Kelaat Mgouna. – Walk through the Spectacular Mgoun Gorges. Arrival in Marrakech and spending the night in the hotel. Early morning after breakfast, we head south and cross the high Atlas by Tizi N’Tichka pass till we arrive at the south side of the Atlas Mountains. We enjoy the spectacular views and have lunch in the city of Ouarzazate. After lunch, we drive to Skoura oasis, Keala of Mgouna and the Dades Valley. Overnight in the local guesthouse. The estimated duration of the drive is 7 hours. After breakfast in the morning, we begin our hike crossing the cultures on terraces (barley, maize, rose), to leave this beautiful valley towards the green Mgoun Valley. After lunch we proceed by crossing the river, it takes about 90 minutes trek to get to Ighrem Aqdim village. Overnight in tents. The estimated duration of the trek is 6 hours. Leaving Ighrem Aqdim after breakfast to explore the green valley, and gorges with beautiful old villages. We have lunch in the shade of the Gorges (towards the exit of the canyons). After lunch, we proceed in the afternoon by enjoying the panoramic views of the high Atlas Mountains while taking a short walk on mule trails. Overnight in tents. 5 hours trek. We descend the valley of Oleanders and pass through the villages of Agouti, El Hot. Lunch picnic near the river and proceed later in the afternoon on our trek to the town of Boutghrar. We spend the night camping or in a local gite. 6 hours of walking. The trek continues through the Valley of Roses to explore the authentic architectural designs of the old villages. You enjoy the views of the roses emerging from the fields of potatoes and maize. The Roses prevent the herd of animals from entering the cultures. The region is known for manufacturing Roses water. Overnight in a local gite. 6 hours of trekking. In the morning, after breakfast, we head back to Marrakech through 1000 kasbahs road. Those interested in stopping over for Rose products at Kelaa Mgouna can do so during the journey, we have lunch in Ait Benhaddou Kasbahs. Overnight in the hotel at Marrakech. – Rose valley trek is available and can be arranged for groups of all sizes. Rose valley trek offers a multitude of options for those who love exploring by foot. Hiking tour in Roses Valley, Rose Valley Trek Morocco.